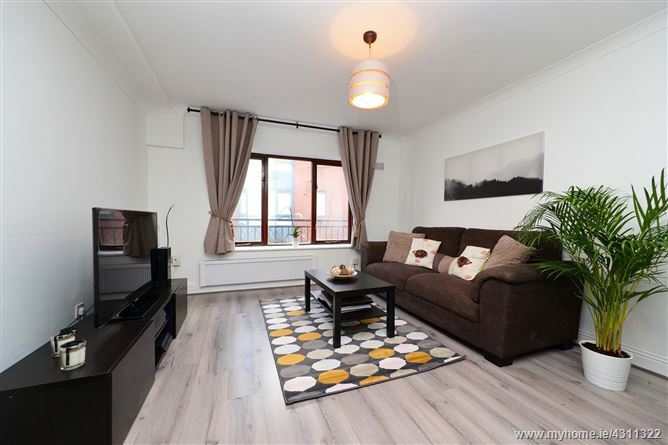 Stunning one bedroom first floor apartment comes to the market in turn key condition. The apartment is nicely situated in the quiet development of City Gate facing the internal courtyard. On entering there is a hallway that leads into the main living room. The main living area is a bright space that features high spec laminate flooring. The contemporary kitchen is accessed through an archway. The stylish kitchen is well finished with black cabinetry and a chimney style extractor fan. The laminate flooring is continued into the bedroom which is a comfortable space. The bathroom is well finished and accommodates a bath / shower unit. The development is well located on the banks of the River Liffey. Temple bar is a short walk away which is a hive of activity, home to a wide variety of restaurants, cafes and bars. Just across the River is Smithfield Square which is one of the city’s most fashionable districts. Here there is more entertainment in the form of the Lighthouse Cinema and a host of eateries.